The FLEX STEER controls steering effort based upon as driver's preference or road condition. 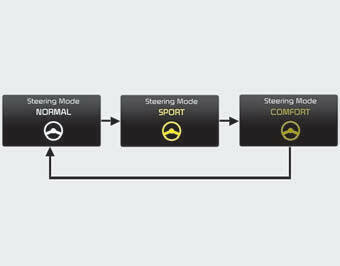 You can select the desired steering mode by pressing the FLEX STEER button. When the steering mode button is pressed, the selected steering mode will appear on the instrument cluster. 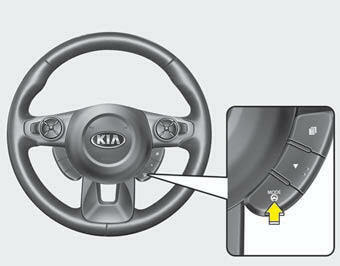 If the steering mode button is pressed within 4 seconds, the steering mode will change as shown above. If the steering wheel mode button is not pressed for about 4 seconds, the LCD display will change to the previous screen (for Type B cluster). The normal mode offers medium steering effort. The steering wheel becomes heavier. The sport mode is usually used when driving on the highway. The steering wheel becomes lighter. 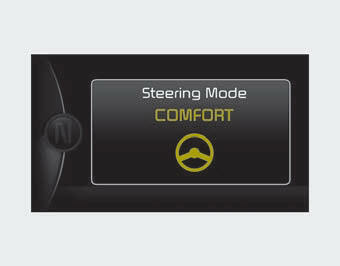 The comfort mode is usually used when driving in the city or when parking the vehicle. For your safety, if you press the steering mode button while operating the steering wheel, but the steering effort will not change immediately. After operating the steering wheel, the steering effort will change automatically to the selected mode. Use caution when changing the steering mode while driving. When the electronic power steering is not operating properly, the flex steering wheel will not work.